Loretta H. Rush took the oath of office as Indiana's 108th Supreme Court Justice in November 2012 after being appointed by Governor Mitch Daniels. The Judicial Nominating Commission named her Chief Justice in August 2014. As Chief Justice, Rush is responsible for supervising the entire judicial branch. That includes administration and funding of court programs across the state. A central administrative office with multiple agencies works under Rush's direction to handle everything from caseload measures to technology updates to admission and discipline of lawyers. With millions of cases already in a central system, the Court continues to use technology to improve access and efficiency. The ability to e-file documents in both the trial and appellate courts became a reality under Rush's leadership with strong support from judicial colleagues, clerks, and bar associations. Chief Justice Rush serves on the Conference of Chief Justices Board of Directors (2nd term) and is co-chair of the National Judicial Opioid Task Force. In addition to being a member of local, state, and national bar associations, Chief Justice Rush is a Life Fellow of the American Bar Foundation. She is an Academy of Law Alumni Fellow for the Maurer School of Law. She chairs or is a member of several commissions (including the Commission on Improving the Status of Children in Indiana and the Judicial Nominating/Qualifications Commission). Most recently, Chief Justice Rush was named the 2018 Indiana Chamber Government Leader of the Year. She has also received the Purdue University Distinguished Alumni Award with induction into the Boiler Business Exchange Hall of Fame; the Indianapolis Bar Association's Antoinette Dakin Leach Award; the Indiana Civil Rights Commission Spirit of Justice Award; and the Indiana Business Journal Women of Influence Award. 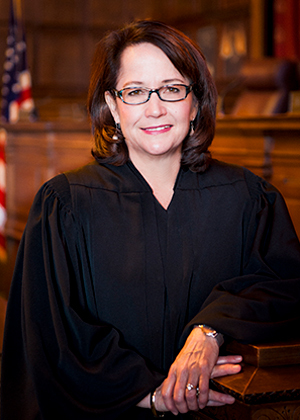 Prior to her appointment, Rush spent 15 years at a Lafayette law firm and was elected three times to serve as Tippecanoe Superior Court 3 judge. She was born in Pennsylvania and moved frequently as a child before settling in Indiana in 1972. She earned her undergraduate degree from Purdue University and her law degree from Indiana University Maurer School of Law, both with honors. She is married to Jim Rush with four children and two grandchildren.